“The conditions are now right to create a strong market,” says Goode Intelligence which forecasts that the current global user base of four million mobile biometrics users will grow to 39 million by 2015. 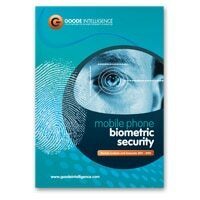 Goode Intelligence has published a new report that investigates the market for incorporating biometrics into mobile phones in order to prove that a secure transaction being conducted on a handset is being performed by the device’s actual owner. Goode states in the report that there are indications that more device manufacturers are turning to embedded mobile biometrics to enhance security and differentiate their models in an ever-crowded market; “Motorola has been heavily marketing the security benefits of using biometrics (fingerprint sensor) to protect its enterprise-ready Android smartphone, the Atrix, and there are rumours circulating of voice recognition features in the next generation of Apple’s iPhone 5. A convenient alternative to PINs and passwords: Swiping a finger on a phone or providing a verbal ‘voiceprint’ can be an easier and far more convenient way to provide authentication than conventional technologies.